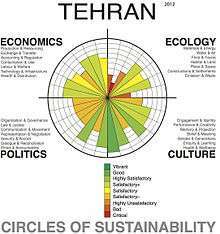 The method began with a fundamental dissatisfaction with current approaches to sustainability and sustainable development, which tended to treat economics as the core domain and ecology as an externality. Two concurrent developments provided impetus: a major project in Porto Alegre, and a United Nations’ paper called Accounting for Sustainability, Briefing Paper, No. 1, 2008. The researchers developed a method and an integrated set of tools for assessing and monitoring issues of sustainability while providing guidance for project development. The method was then further refined through projects in Melbourne and Milwaukee, and through an ARC-funded cross-disciplinary project that partnered with various organizations including Microsoft Australia, Fuji Xerox Australia, the City of Melbourne, World Vision, UN-Habitat and most crucially Metropolis. 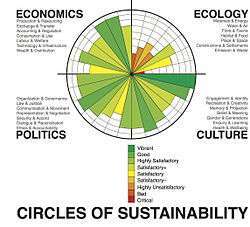 A further refining of the ecological index quadrant is underway in Canada. The Canadian project is significant because it is developing an ongoing index that measures and scores the ecological footprints cities have on their surrounding ecosystems. 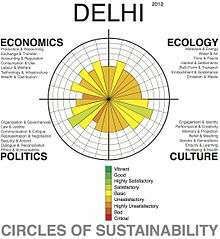 In 2011, The Economist invited Paul James (Director of the UN Global Compact Cities Programme) and Chetan Vedya (Director, National Institute of Urban Affairs, India) into a debate around the question of urban sustainability and metropolitan growth. It led to over 200 letters to the editor in direct response as well as numerous linked citations on other websites. The Circles of Sustainability method has had its primary operational testing in cities, municipalities and international NGOs, and apart from being used to develop the materiality process for FujiXerox does not appear to be used by any corporations. 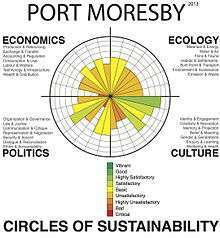 While the method includes a relatively simple self-assessment process, earlier versions of the Circles of Sustainability method have been criticised for requiring substantial commitment of time and expertise. ↑ "CITIES - The Cities Programme". citiesprogramme.com. 2012. Retrieved September 8, 2012. ↑ Liam Magee, Paul James, Andy Scerri, ‘Measuring Social Sustainability: A Community-Centred Approach’, Applied Research in the Quality of Life, vol. 7, no. 3., 2012, pp. 239–61. ↑ Liam Magee, Andy Scerri, Paul James, Lin Padgham, James Thom, Hepu Deng, Sarah Hickmott, and Felicity Cahill, ‘Reframing Sustainability Reporting: Towards an Engaged Approach’, Environment, Development and Sustainability, vol. 15, no. 1, 2013, pp. 225–43. 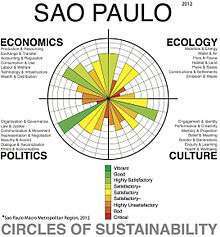 ↑ Stephanie McCarthy, Paul James and Carolines Bayliss, eds, Sustainable Cities, Vol. 1, United Nations Global Compact, Cities Programme, New York and Melbourne, 2010, 134pp. ↑ ‘Semantic Technologies to Help Machines Understand Us: Fuji Xerox leads RMIT to $1.4m Grant for Real-Time Green Reports’, IT Business, 30 October 2009. Mary-Lou Considine, ‘UN-RMIT Relationship Tackles Problems in the Pacific’, Ecos Magazine, August–September 2009, p. 150. 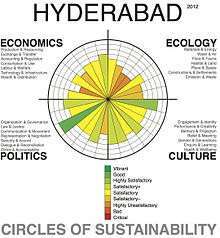 ↑ Andy Scerri and Paul James, ‘Communities of Citizens and “Indicators” of Sustainability’, Community Development Journal, vol. 45, no. 2, 2010, pp. 219–36. Andy Scerri and Paul James, ‘Accounting for Sustainability: Combining Qualitative and Quantitative Research in Developing ‘Indicators’ of Sustainability’, International Journal of Social Research Methodology, vol. 13, no. 1, 2010, pp. 41–53. 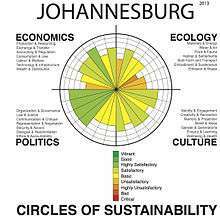 Paul James and Andy Scerri, ‘Auditing Cities through Circles of Sustainability’, Mark Amen, Noah J. Toly, Patricia L. Carney and Klaus Segbers, eds, Cities and Global Governance, Ashgate, Farnham, 2011, pp. 111–36. Andy Scerri, ‘Ends in View: The capabilities approach in ecological/sustainability economics’, Ecological Economics 77, 2012, pp. 7-10. ↑ "GreenScore City Index". greenscore.ca. 2014. Retrieved January 12, 2015. ↑ Milwaukee Business Journal, 29 April 2009; John Schmid, Milwaukee Journal Sentinel, 27 April 2009. ↑ "Milwaukee - The Cities Programme". citiesprogramme.com. 2012. Retrieved September 8, 2012. ↑ "UN Global Compact | Milwaukee Water Council". thewatercouncil.com. 2012. Retrieved September 8, 2012. ↑ "Publications / Commissions | Metropolis". metropolis.org. 2012. Retrieved September 8, 2012. ↑ "Metropolis Initiative "Integrated Strategic Planning and Public Private Partnerships" meets in New Delhi | Metropolis". metropolis.org. 2012. Retrieved September 8, 2012. ↑ "Economist Debates: Cities". economist.com. 2012. Retrieved September 8, 2012.